We humans have an incredible capacity for faith. We seem to believe that our cars will always work right whenever we go out to start them up in the morning. We trust our money to have value, allowing us to buy whatever we may think we need or want. We can even trust technical manuals written by other flawed human beings. Yet, somehow we just can’t seem to trust the words of God in the Holy Bible. Why is that? When a forklift or pallet jack is no longer functional, we typically have to take out to the shop for the mechanics to have a look at it, providing that they are not already swamped trying to fix a trailer that has taken an unfortunate tumble. Given how there are several different makes and models of forklifts and pallet jacks, it is no surprise that each type requires its own manual. Certainly the manual from one may be able to help to figure out another, but the repair would also be sub-par at best. However, if a company primarily has a fleet of forklifts made by Toyota, then it is expected that the forklift repair manual will be for Toyota. If there happens, by some odd chance, to be a forklift made by Nissan and no manual, the mechanic will use the Toyota manual as much as is reasonably possible, trusting that many of the components are the similar, if not the same. At that point they have to operate on faith, specifically that a manual for a specific forklift will help fix a different model. It was by faith that Abraham trusted God and the promises of God when he set forth from him father’s home in Ur to go forth to a land in which he would be a pilgrim and stranger. It was also by faith that Abraham was willing to sacrifice Isaac, trusting that whatever God was doing would have positive results (God was really showing Abraham how great his faith was, in this way was God testing Abraham). By faith, Moses led forth the children of Israel from the land of Goshen in Egypt, never mind that Moses had no experience as a leader, and that he had a speech impediment. It was by faith that Moses led them by day and by night, following the pillar of flame at night and the cloud by day to a land that he did not know of. Faith. Such an easy word to say. Not so easy to understand. We gladly, and often unwittingly, put our faith in the things of men. How sad it is that we can not do so when it comes to the things of God. Many who call themselves “christians” do not necessarily even know what the Bible says. Some seem to think it is a book of stories. Others a book of history, though perhaps muddled with mythology. Others see it as merely a guide and look to other sources for how to live in this world. Such thinking is wrong. The Bible is God’s revelation of how history began, how he provided forgiveness to us for our sins, and how the world will ultimately end. Along the way, he also provides, via the various people who’s lives are recorded in scripture, some basic instructions for living in the world. Both in terms of what we can and should do as well as what we can not or should not do. In some ways, just like a repair manual for forklift. A forklift repair manual covers basic maintenance and complete overhaul procedures. In like manner, the Bible gives good practical advice for living and also more thorough advice about overcoming sin and living a life that is pleasing to God. In short, just like we should for the manual when repairing a forklift, we should use the Bible to guide our lives and follow God’s advice as it is written. Basically, do it by the book. No other book will give you the knowledge of how sin entered our world or how you can, via the death and resurrection of Christ Jesus, enter into everlasting life and walk with him in paradise. Faith. So easy to say. To bad we don’t try to fully understand it by the book. Perhaps, if we followed the manual, we would have less problems to fix. 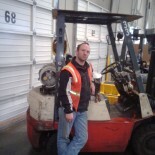 This entry was posted on 23/08/2013 by Christopher Rose in Uncategorized and tagged Abraham, Bible, Faith, Forklift truck, God, manual, Moses, Pallet jack, trust.